Furniture includes devices and equipment used and designed for furnishing residential and public interiors. 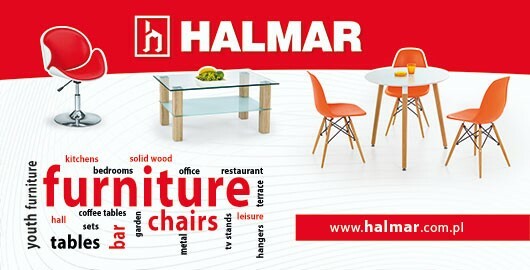 Furniture is usually made from: wood and wood-like materials, metal and aluminium, plastic, stone and glass. Furniture serves a very important role and is crucial in everyday life of every man, facilitating their daily functioning. Furniture is used for working and eating, for lying and resting, for sitting and relaxing, as well as for storing things. Furniture can also serve as a complement or a support or can be multi-functional. Apart from the functional properties, furniture can have a representative or decorative function. Garden furniture does not only mean garden tables and chairs, but also all kinds of garden boxes, flower pots, swings, wheelbarrows and many other. Products belonging to the group enhance the pleasure and attractiveness of the time spent outdoors e.g. in our own garden or on the plot. The furniture offers a wide range of shapes and types to meet our individual needs and serve different functions and to make it fully functional. It is essential that garden furniture is made of materials resistant to such external conditions as wind, rain or snow. Garden furniture is usually made of rattan, steel, metal and cast iron elements or plastic, as well as of wood and stone. If it has been properly impregnated, it can serve for many years. Upholstered furniture constitutes exclusive and comfortable rest – and - relaxation sets, as well as really comfortable upholstered sofa-beds, couches and sofas which can be placed in any room, both in the bedroom and the living-room. Looking for suitable upholstered furniture, one should take into account the functionality and quality of the materials it was made of. The furniture is usually upholstered with natural or artificial leather, cotton or velvet. The furniture should not be excessively exposed to the sun to avoid its fading, it should not be placed near heat source like fireplaces or radiators, and also any stains or dirt should not be left on its surface for a long time. Kitchen is one of the most heavily used rooms in the house and hence it must be carefully designed and furnished. Kitchen furniture should be useful and functional so one should take into account the size of cupboards, their opening types and the availability of additional shelves, baskets, drawers and other storing places. The furniture should be made so that it is resistant to moisture, high temperature, or scratches and that it goes well with the interior design. Kitchen furniture is usually custom-made and the materials used include solid wood, laminated MDF board and natural wood veneer (the so called veneered furniture). Kitchen furniture includes, above all: hanging kitchen cupboards, built-in cupboards, kitchen shelves, kitchen tops, standing sink cabinets. Office furniture. An office is not only equipped with electronic devices including scanners, telephones, printers, fax machines, photocopying machines or computers. To use the state of art devices in a convenient way, it is essential to have some useful furniture for keeping and storing the devices. Office furniture serves two important roles: to facilitate the work of a company and make it more pleasant, as well as to create the image of the company. The most desirable office furniture holds both ergonomic and aesthetic properties and is made of high-quality, resistant materials. Office furniture, in terms of its functionality and location, can be divided into several groups: executive furniture (desks, office chairs, office cabinets), conference furniture (conference tables, conference chairs, conference shelves), operative furniture (office desks, office chairs, cabinets for documents, shelves for binders, office tables) and reception furniture (reception desks). When choosing office furniture, it is important to check how the furniture can be adapted to the individual needs and expectations of a user. Shop furniture constitutes devices and equipment which should remain in good condition for many years. Well chosen furniture should facilitate the work in the shop and enhance the comfort of its clients, encouraging them to do the shopping longer and more often. When buying shop equipment, it is important to pay attention to the information concerning maximum load capacity of shelves or if a given furniture set is safe for both the clients and the staff and, at the same time, suitably shows the presented goods. Shop furniture includes mainly: shop shelving, shop tops, shop showcases, shop racks, shop shelves and shop compartments made of wood, stainless steel and tempered glass, depending on their destination, custom-made, to meet individual needs of every client. Bathroom furniture must be resistant to moisture and heat. That is why, the best materials to make the furniture include glass or mirror, different types of plastic (laminated furniture board, less often MDF board which is not that resistant) covered with an appropriate varnish or other protective material. In the case of bathroom furniture, convenience of use and functionality are the qualities that really matter. It is important to check if the drawers and doors can be operated easily and smoothly, if there is a sufficient number of compartments and if the opening handles are available. Bathroom furniture includes: built-in bathroom furniture, basin cabinets, hanging bathroom shelves, dressing tables, standing bathroom cabinets, bathroom hangers. Metal furniture is commonly used in physician’s and dentist’s offices, medical centres and hospitals, schools, and in different types of workshops, warehouses and factories or in the garden. The furniture can be used for storing important files and documents, hygienic materials, tools or medications. Metal furniture, if covered with an anti-corrosion coating, does not require any special treatment or care, it is also highly resistant to damages and can be easily cleaned. Thanks to its high resistance and durability, the furniture is more and more often used in houses too (metal beds, metal cabinets, metal bookcases, metal tables and metal benches). Metal furniture is usually made of aluminium, cast iron or steel. Bed is one of the most important pieces of furniture in the bedroom. A well-chosen mattress is essential too. To tell the truth, all the remaining furniture should be matched to the previously chosen bed. Bedroom furniture should be comfortable and functional at the same time. All of the furniture should go together well in terms of colours, design and size. Solid finish (custom-made bedroom furniture is worth considering), well-planned layout and paying attention to the smallest detail will give you comfort and convenience of use for many years. Apart from a bed, each bedroom should be furnished with a big and spacious wardrobe (unless there is a separate wardrobe in the house), a chest of drawers for the underwear, a small table or bedside tables (a bedside cabinet is an option), as well as a bedroom dressing table. Bedroom furniture can be made of solid wood, wood-like materials or metal. Bedroom furniture includes: wardrobes, bedside tables, bedside cabinets, chests of drawers, beds and built-in wardrobes. International transport, in Poland is the transport which begins in Poland and ends in the country not belonging to the EU, or begins in the country beyond the EU and ends in Poland. Polish international transport also means the transport which begins and ends beyond the EU and runs through Poland along some stretch, the so called transit.